MK Dons manager Karl Robinson (left). There’s no sign of a bitter rivalry between the respective managers of Peterborough United and MK Dons ahead of tomorrow’s (August 27) League One clash at stadium:mk. 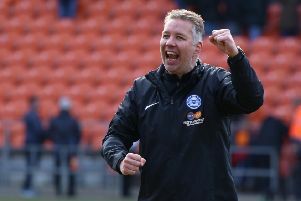 The clubs have clashed repeatedly in big games in the last decade, during which Posh chief Grant McCann and MK boss Karl Robinson have developed a healthy respect for each other. Grant McCann scores a penalty for Posh at MK Dons in a League One play-off semi-final at stadium:mk in 2011. McCann admits he looks up to a manager he is desperate to beat tomorrow. “It’s great what Karl and his club have achieved in recent seasons,” McCann said. “The club stuck with their manager and his hard work and dedication was eventually rewarded with promotion to the Championship. “It was a shame for them that they were relegated straight away, but they will be stronger for the experience and even more determined to get back there. “I look up to Karl and respect what he achieved. MK Dons are a bit like us as they are not afraid to play youngsters and they occasionally sell good ones, like Dele Alli for instance. Robinson was also keen to confirm his respect for McCann and for Posh as a whole. “We know the importance of the game to our fans,” Robinson stated. “We also know the fans want a Twitter ‘war’ or whatever afterwards, but we have a lot of respect for them, as they have for us, and that goes all the way up to boardroom level. “We go into every game wanting to win, but there is a bit more spice to this one, albeit in the stands rather than on the green stuff. “It will be Grant’s first experiemnce of the game as a manager, but he’s played in the fixture enough times to know what to expect. One thing’s for sure, we will both try and win the game in the right way. “Peterborough have a lot of qualities. Individually they are very good. They can rotate and they are aggressive out of possession. They are quick and dynamic in defence. They beat Millwall 5-1 which shows they have the firepower as well.